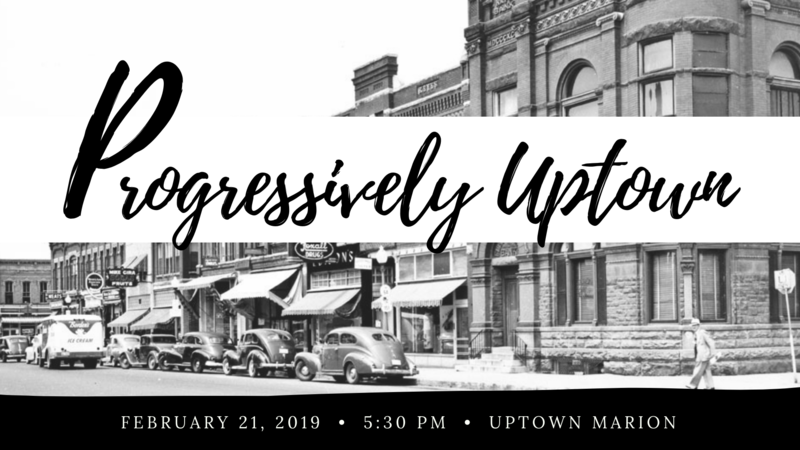 Uptown Marion, an Iowa Main Street District, is pleased to announce “Progressively Uptown” event. Enjoy a night out on the town for a good cause! At this winter fundraiser event, experience locations, dining options, and entertainment in Uptown. The night will progress from dinner and drinks to the Giving Tree Theater for a private dress rehearsal showing of “Tiny Beautiful Things”. Uptown is entering a new phase with new shops, dining, and entertainment options that are progressive for the historic district. Similar to a progressive dinner, attendees will start at the Uptown Snug to check in and have a beverage, then proceed to 2 more locations with food and beverages. Ramsey’s will be featuring new food items and adult beverage options and attendees will have a sneak peek at the newly renovated Court building featuring high end condo living Uptown style. From there, the party will move to The Giving Tree Theater for dessert and a full private preview showing of “Tiny Beautiful Things” set to debut on the following night. During the intermission over $800 in prizes from Uptown Businesses will be given out. Help us progress Uptown further with 100% of the proceeds going towards Uptown programs and community events. Funding supports programs such as local sign grants, business workshops, historic preservation grants, community events and entertainment, beautification efforts, district promotions, holiday lighting, and so much more! Tickets are $50 per person, tax included, and will be available until February 20. Ticket price includes one raffle entry, food and beverage at 3 locations, followed by dessert and private show at Giving Tree Theater. All proceeds benefit the ongoing revitalization and beautification efforts of Uptown Marion – A Main Street Iowa District. Marion Dental, THE chocolate SHOP, Giving Tree Theater, Ramsey’s Wine Bistro, Hills Bank and Trust Company, McGrath Auto, The Uptown Snug, Roots in Bloom, Philips Diamond Shop, Vella Yoga, JOY, Di Moda Boutique, Be Inspired, Lillian’s of Marion, Treasure Chest Collectibles, Awaken Vitality Holistic Healing, The Famous Mockingbird, Destiny Hastings – Color Street, Cedar Rapids River Kings, The Grill Works, Iowa Magic Shop, Brick Alley Pub, Marriott Townplace Suites, The Kettel House, Marion Hy-vee, Olmstead Construction, Happenstance on 7th, Cast of Thousands, Noonday – Ingrid, Wit’s End Coffeehouse, 31 Consulting, Parks & Schmit Orthodontics, Bistro 3 Nineteen, SCOUT of marion, Culvers Garden Center, Monroe+co, and La Cantina.